Space shuttle Discovery rolls March 9, 2011 into Kennedy Space Center’s Orbiter Processing Facility-2 in Florida after its final mission STS-133. It will be readied for retirement and public display. After landing back on Earth for a final time last week, space shuttle Discovery is all but officially destined for the Smithsonian. But before Discovery can be turned over to the Washington institution, the shuttle will undergo an autopsy of sorts, providing NASA engineers one last chance to learn what they can by cutting into the world's most flown spacecraft in history. Discovery – NASA's third shuttle orbiter to be built and the first to reach retirement – capped a career total of one year aloft with the 13-day STS-133 mission. The mission installed the last of the pressurized modules or rooms for the U.S. side of the International Space Station. 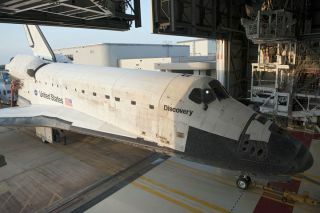 Discovery and its six crew members touched down on March 9, marking the end of Discovery's 39th and final spaceflight. Now inside Orbiter Processing Facility-2, one of the three hangars at the Kennedy Space Center in Florida where the shuttles are prepared between missions, Discovery will at first be put through a post-flight processing flow similar to what occurred after each of its 38 earlier trips to space. "It's not as quick as you might think," said Mike Leinbach, NASA's shuttle launch director. "It is many, many months away before we'll be ready to hand [Discovery] over." "We are going right into what we are calling our 'transition retirement' processing flow, which in many ways is very similar to the processing flow to get the vehicle ready for flight again. It is just this time, we are not preparing her for flight, we are preparing her for display," Stephanie Stilson, flow manager for orbiter retirement, told collectSPACE.com. Up until STS-133, Stilson oversaw Discovery's processing as its dedicated flow manager. "The first part of that schedule is to go in and do what we call 'down mission processing,' and that is very similar to what we'd do if we were going to fly again. Every vehicle once it lands has to go through some securing and safing that has to happen right away," Stilson said. Leinbach detailed some of the work at a press conference following Discovery's landing. "We have to get the cryogenic [propellants] out of the fuel cell system, there are some [hypergolic fuels] we need to drain, those types of things," Leinbach said. "Pyrotechnic cartridges need to be removed. Those types of things are all very standard and that [takes] a couple of weeks." After that work is complete, Discovery will enter a phase Stilson called "transition and retirement safing." "In other words, to have the general public be able to be up and close and personal with Discovery, there are a lot of hazardous commodities we have to remove," explained Stilson. According to launch integration manager Mike Moses, the systems to be stripped out of Discovery include ammonia, nitrogen tetroxide and monomethylhydrazine, all of which could pose a risk to future museum visitors if left intact. "We have talked about do you try to just decontaminate all the lines or just remove them. In some instances, we're going to remove the plumbing," said Moses. As Stilson and her team work to make Discovery safe for display, they will also be asked to remove components for forensic study, said Bill Gerstenmaier, NASA's associate administrator for space operations. "We can still learn a lot from these vehicles. There are some hydraulics systems and some other things that we haven't really had a chance to have a look at because it was really too invasive to get in there and take a look at it," Gerstenmaier explained. "So we're going to request that the teams help us pull a couple of those components out to do some real detailed forensics on so we can then learn about them for the next generation of vehicles," he said. Continue reading at collectSPACE to learn what NASA plans to keep, what it plans to remove, and when NASA will officially announce where Discovery is going.